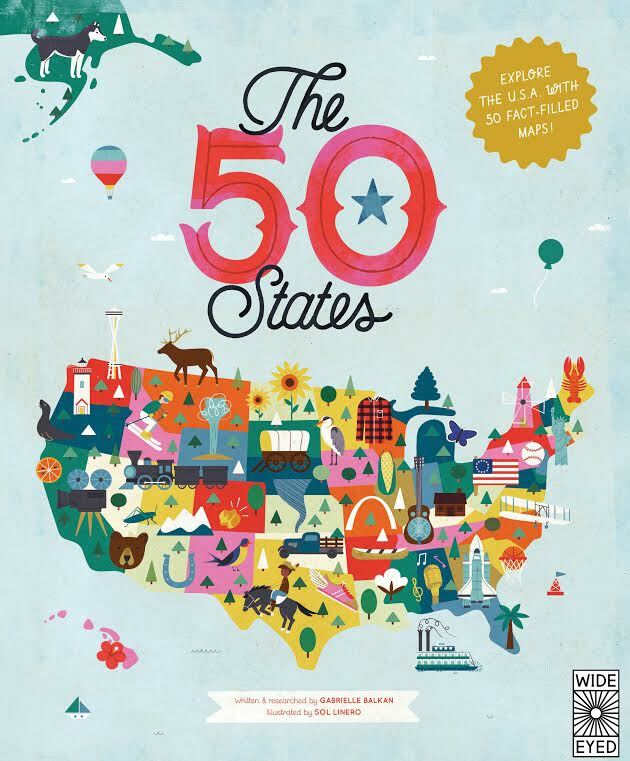 Be inspired by the inventiveness, beauty and diversity of the United States in this curious collection of fact­filled maps. Explore thousands of wondrous locations and be awed by the achievements of hundreds of people who helped make America what it is today. Celebrate, explore, enjoy! A keystone is the central wedge in an arch that locks all the other stones in place; and so Pennsylvania—The “Keystone State”—was the central state of the original 13 colonies, playing an important role in the history of the nation. As the birthplace of independence and the Constitution itself, Pennsylvania is something of a spiritual home for history lovers. There are plenty of chances to travel back in time: visitors can walk the Gettysburg Battlefield, see the iconic Liberty Bell, or venture within the hallowed walls of Liberty Hall, and that’s just the tip of the iceberg! Aside from history, the second state has a lot more to offer. Philadelphia and Pittsburgh are thriving university cities with big music, theater, and art scenes. Or, for a chance to get away from it all, you can head to Pennsylvania’s stunning forests and mountains. And if you really want to escape the hustle and bustle, then take a trip to Lancaster County and discover the Amish community’s simple, peaceful way of life. BANANA SPLIT PA BANANA SPLIT This famous sundae was first served in Latrobe in 1904. BETHLEHEM PA BETHLEHEM is home to the Just Born candy factory, where marshmallow Peeps are made. On New Year’s Eve, a giant Peeps chick is dropped from a crane! BOONE TOWN PA BOONE TOWN The home of 18th- century pioneer Daniel Boone can be visited in Baumstown. CAPITAL CITY PA CAPITAL CITY Lancaster served as the nation’s capital for one day! CITY LIFE PA CITY LIFE Forbes.com named Pittsburgh America’s “Most Livable City” in 2014. COVERED BRIDGE PA COVERED BRIDGE Pennsylvania has the most covered bridges of any state in the country! EMOTICONS PA EMOTICONS The first two Internet emoticons, the smiley and frowny faces, were invented at Carnegie Mellon University in Pittsburgh. FALLINGWATER PA FALLINGWATER Frank Lloyd Wright designed this house, built over a waterfall in the Laurel Highlands. FORK IN THE ROAD PA A FORK IN THE ROAD Literally. A 9-foot dinner fork stands at an intersection in Centerport. GETTYSBURG PA GETTYSBURG The famous site of the battle hailed as a turning point in the Civil War. GOBBLER’S KNOB PA GOBBLER’S KNOB is famous for furry resident Punxsutawney Phil: a groundhog who predicts how long winter will last. 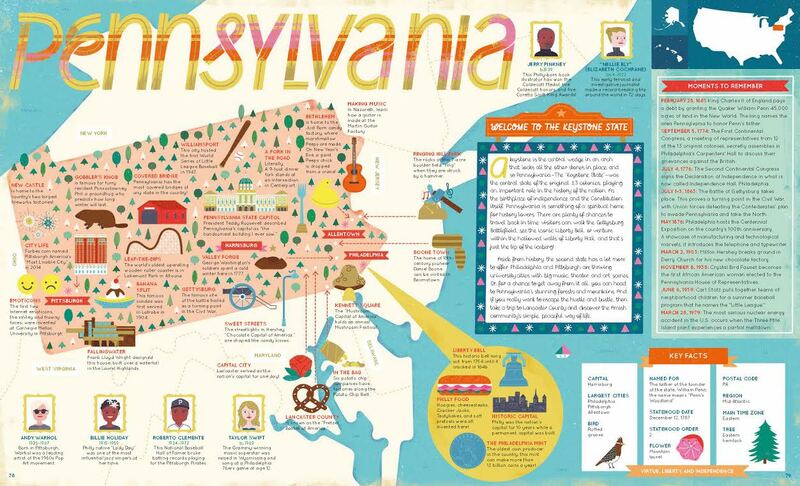 HISTORIC CAPITAL PA HISTORIC CAPITAL Philly was the nation’s capital for 10 years while a permanent capital was built. IN THE BAG PA IN THE BAG Six potato chip companies have factories along the Potato Chip Belt. KENNETT SQUARE PA KENNETT SQUARE The “Mushroom Capital of America” holds an annual Mushroom Festival. LEAP-THE-DIPS PA LEAP-THE-DIPS The world’s oldest operating wooden roller coaster is in Lakemont Park in Altoona. LIBERTY BELL PA LIBERTY BELL This historic bell rang out from 1754 until it cracked in 1846. MAKING MUSIC PA MAKING MUSIC In Nazareth, learn how a guitar is made at the Martin Guitar Factory. NEW CASTLE PA NEW CASTLE is home to the country’s two largest fireworks factories! PHILLY FOOD PA PHILLY FOOD Hoagies, cheesesteaks, Cracker Jacks, Tastykakes, and soft pretzels were all invented here! SWEET STREETS PA SWEET STREETS The streetlights in Hershey, “Chocolate Capital of America,” are shaped like candy kisses. THE PHILADELPHIA MINT PA THE PHILADELPHIA MINT The oldest coin producer in the country, this mint can make more than 13 billion coins a year! VALLEY FORGE PA VALLEY FORGE George Washington’s soldiers spent a cold winter here in 1777. WILLIAMSPORT PA WILLIAMSPORT This city hosted the first World Series of Little League Baseball in 1947. Author GABRIELLE BALKAN has written over 20 books for children, including the Mr Presidents series for Scholastic. She lives and works in New York.